Instead of the messy job of growing and caring for real lawn, newly appointed Midlands Easigrass partner, Jock Coombes, recommends realistic and high quality artificial grass. Jock sells and installs Easigrass*, and he believes it is guaranteed to put an end to many of the turf wars endured by home owners, schools, recreational facilities and hotels. “With 365 days use and very little maintenance or degradation, this is a cost-effective investment ideal for any home, office, commercial building, hotel or guest house, sport, play or recreational area. It looks and feels like real grass but remains green all year. Come rain or shine, there’s no mud or dust,” says Jock. Some of the benefits of installing artificial grass include no more mowing, watering, feeding or spraying with environmentally unfriendly weed killers or insecticides. Easigrass, marketed locally by Van Dyck Floors, hails from London and has been used in a number of top restaurants, beautiful residential gardens, international sporting facilities and premiership soccer clubs around the globe. Jock has created the perfect on-site display of the commercial application of Easigrass in high traffic outdoor areas at Celtiskloof Lifestyle Centre (CLC) in Howick. Used as a party area, the Easi-Play small sided soccer pitch and Easi-Play under lights display not only shows that this is truly tough turf but also displays the aesthetic value of Easi-play Knightsbridge and Kensington variants alongside a variety of EnviroBuild rubber products that are used for walkways, lapa areas and even an outdoor chess set. “The most obvious advantage is that time-pressed homeowners will not have to spend their weekends manning the mower or the weed eater. Easigrass is also perfect for hard-to-grass areas such as under trees or close to buildings,” says Jock. Artificial grass has myriad applications, including back and front gardens,revitalising patios, terraces, play areas and more. It can also transform a pool area and prevent singed soles from hot slate or tiles in the summer sun! One of the biggest plusses, according to Coombes, is that artificial grass is a once-off investment that delivers ongoing savings. Apart from not paying for garden services, garden implements and expensive lawn dressings and chemicals, artificial turf will also shrink water and electricity bills. It is particularly popular in areas where water is scarce and drought is common and ensures plush green grass rather than brown and dead lawns in areas that are prone to frost in winter. One of the main benefits of opting for high quality artificial grass over cheaper options is the quality of the product itself and the high standards of installation, says Jock. “We use a geo textile weed barrier that also assists with stability, as well as a premium crusher dust and silica sand infill that protects the backing of our grass from the elements and assists with cooling it once it has been lightly watered. It gives the home owner a real feel when walking on our grass and eliminates the crunching sound that has been traditionally associated with artificial grass. The recent introduction of new yarns and technology in the manufacturing process has created artificial turf that is more upright and remains cooler than the normal flat yarn synthetic grass,” says Jock. Easigrass partners such as Jock have access to the very latest technology and developments in the synthetic grass arena. They also provide quality assurance, design excellence and product backup and guarantees. “Easigrass is becoming a household name for quality and backup service. 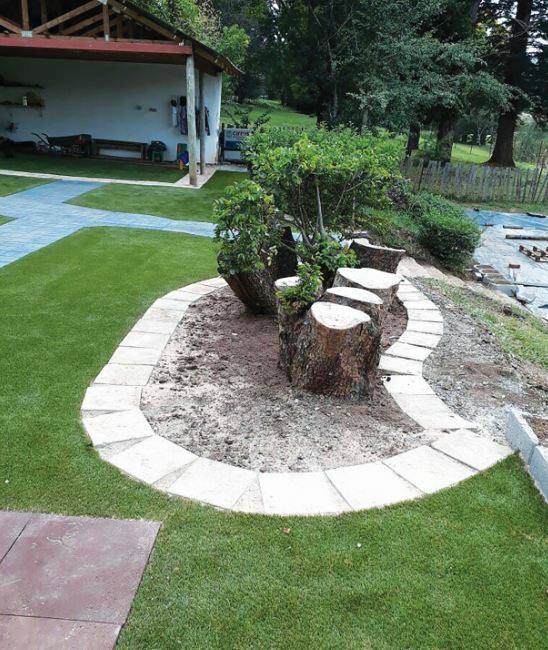 Easigrass Midlands offers payment terms to assist homeowners wishing to invest in improving their properties,” he says, referring to the eight year warranty offered by Van Dyck on professionally installed products. For more information, contact Easigrass on 087 5507 464 or via www.easigrass.co.za, or Van Dyck Floors on +27 (31) 913 3800 or www.vandyckfloors.co.za.